The US Navy's new $13 billion USS Ford aircraft carrier (CVN-78) is a disaster. (pictured below) It cost almost twice as much as the proven Nimitz class, yet it cannot reliably launch and recover aircraft. This occurred because the Navy incorporated experimental systems that were not proven after years of research, development, and testing. They were still in development when the Ford began construction, but Admirals decided to install them anyway and hope for the best. The Navy didn't even begin launch tests with aircraft ashore using the new Electromagnetic Aircraft Launch System (EMALS) until after construction of the Ford commenced! The Navy began funding EMALS in 1995 and contractor General Atomics began testing this launch system in 2004. When a test aircraft ashore at Lakehurst fails, a "soft launch" occurs and the aircraft just rolls down the runway, and not off the bow of a carrier at sea. It has improved since 2014 so one out of every 240 launches fail, which would roll an aircraft into the ocean due to a lack of speed needed to take-off. This means each deployed Ford class carrier would lose an $80 million aircraft each month! The old steam system fails to launch only once a decade, resulting in a cold cat launch, (video here). Crewmen die since aircraft like the C-2 and E-2 have no ejection seats, although ejecting into the sea in front of a huge aircraft carrier is often fatal. This was so alarming that the Association of Naval Aviation called EMALS a disaster! When carrier crewmen saw the four 300 foot long launch tracks on the Ford they were stunned. How can this mass of electrical cables used by EMALS function for months on an aircraft carrier deck at sea? (pictured partially uncovered at a test facility) Hot engine exhaust, heavy rain, saltwater spray, spilled fuel and fluids are sure to erode things, and this quickly became evident aboard the USS Ford. President Trump was briefed last year by officers while aboard the USS Ford. He promptly made a confusing announcement during a Time magazine interview that the Navy must return to steam catapults, something Admirals have refused to say knowing the political firestorm this would cause. News outlets mocked Trump's knowledge of aircraft carrier launch systems because even military reporters cannot grasp how dysfunctional our Navy's procurement system has become. 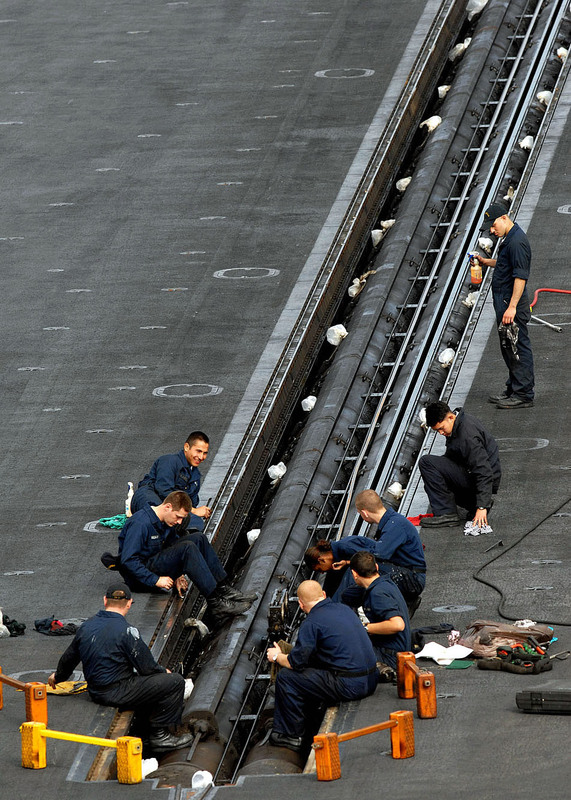 There are 3200 crewmen aboard the USS Ford since last year (pictured repairing the new EMALS) and its future is uncertain as the Navy pushed its first overseas deployment back until 2021! It was launched in 2013, commissioned in 2017, and launched and recovered several aircraft to suggest problems were fixed, although it has not attempted to launch aircraft laden with bombs and extended range fuel tanks. The excuse is that software is buggy. In 2017 the ship's captain proclaimed this has been resolved but the same news report noted doublespeak: "The fix is a software upgrade for the EMALS what won’t be installed until 2019, during the ship’s post-shakedown availability. Until then, launching aircraft is not restricted, but not any with heavy fuel or bomb loads." The Navy states the Ford has launched and recovered 747 aircraft, but fails to mention that most were helicopters. Our Navy loves to brag about its high-tech, but claims it will take two years to download a vital software update? This ship is not deployed, so even if this must be done pierside, why not do that now, rather than stall another year? This sounds like yet another group of Navy leaders evading a major embarrassment by kicking the EMALS can down the road until they retire or transfer. The accepted excuse is that the Navy has no choice but to fix EMALS. However, EMALS is not broken! It is performing as best it can and may not improve! If the Navy began launching dozens of heavy aircraft a day, reliability is likely to worsen! The second ship in the failed Ford class (CVN-79) is 75% complete and construction of the third (CVN-80) began last year. Despite this ongoing disaster, the Navy is pouring more fuel on the fire. In March 2018, the Navy requested that contractors provide cost saving figures to support a plan to begin construction of the fourth carrier sooner! This is based on irrational optimism that serious design problems can be solved soon, after 14 years of development and testing. This is madness since EMALS is unreliable and crewmen continue to identify major changes needed in the Ford design. Moreover, the Navy may be forced to admit to a massive mistake and spend a couple billion dollars to rip the first two carriers apart and install steam catapults! It is past time for good members of Congress and officers in the Navy to stop this madness. The Navy can finish the CVN-79, but funding for CVN-80 and CVN-81 must be delayed until the Navy resolves the Ford disaster. Initial construction of CVN-80 began in August 2017, which should be suspended, while the Ford's EMALS software update is done this summer. She just returned to the yards earlier than planned to repair newly disclosed problems, and will remain there until 2019. EMALS and other systems must improve and demonstrate reliability to the DOTE before construction of CVN-80 resumes. The Navy will develop plans for a new class of aircraft carrier in case this fails next year. This new carrier design will be based on the Ford class, but with proven steam catapults and changes to other equipment that failed on the USS Ford. Hopefully, the problems with the USS Ford can be resolved soon, and changes identified can be incorporated into CVN-80/81, like a hundred more berthing spaces. In addition, the Ford is scheduled for a "shock" test in 2019 that may reveal the need for more modifications. If EMALS problems remain at the end of 2018, Admirals must plan for a new class of aircraft carrier to begin with CVN-80/81. Meanwhile, carrier construction funding can be diverted to another problem, the shortage of carrier aircraft. It makes no sense to build ultra-expensive aircraft carriers and send them overseas short of needed aircraft. This common sense solution must be implemented immediately. The new, fully crewed USS Ford will now spend a year in the yards to fix serious problems. Her first deployment has been delayed yet again, now planned for 2022. • The DOT&E assessment of CVN 78 remains consistent with previous assessments. Poor or unknown reliability of systems critical for flight operations including newly designed catapults, arresting gear, weapons elevators, and radar, could affect the ability of CVN 78 to generate sorties. Reliability of these critical subsystems poses the most significant risk to the CVN 78 IOT&E timeline. • Testing to date involved 747 shipboard launches and demonstrated EMALS capability to launch aircraft planned for the CVN 78 Air Wing. • Through the first 747 shipboard launches, EMALS suffered 10 critical failures. This is well below the requirement of 4,166 Mean Cycles Between Critical Failures, where a cycle represents the launch of one aircraft. 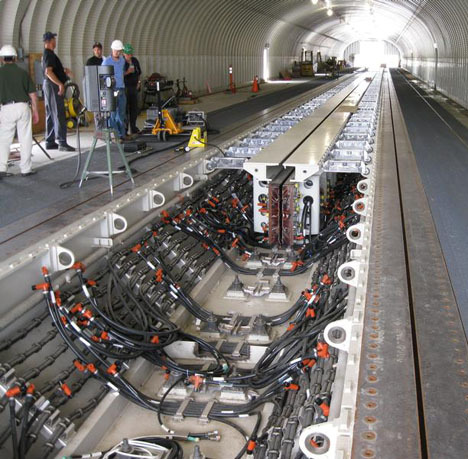 • The reliability concerns are exacerbated by the fact that the crew cannot readily electrically isolate EMALS components during flight operations due to the shared nature of the Energy Storage Groups and Power Conversion Subsystem inverters onboard CVN 78. The process for electrically isolating equipment is time-consuming; spinning down the EMALS motor/generators takes 1.5 hours by itself. The inability to readily electrically isolate equipment precludes EMALS maintenance during flight operations. A few hours later, the Pentagon announced a $15 billion contract for more Ford class carriers.